This weekend ‘The Host’ hits cinemas and stars the Lotus Evora amongst its beautiful cast. 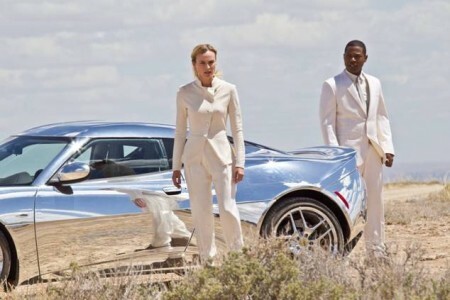 The long awaited movie adaptation of ‘The Host’ written by Stephanie Myer, author of ‘The Twilight Saga’ premiered in LA on 19th March and will be on international release from March 22nd at which time big screens all over the world will be alight with a fleet of awesome looking Lotus Evoras. The movie follows the plight of ‘Melanie’ played by Irish actress Saoirse Ronan as she battles an unforeseen enemy lead by ‘Seeker’ played by Hollywood favourite Diane Kruger. A romantic action-adventure which sees Melanie join resistance fighters as they battle for the survival of the human race, ‘The Host’ is a tale of spirit, individuality and determination – traits that echo Lotus’ own character. Treated in a chrome vinyl wrap and fitted with special-effect lighting, the Evoras are driven by the ‘baddies’ of the piece. It is the mission of ‘The Seekers’ to rid earth from all human negativity achieving this by invading human ‘hosts’ and cleansing their minds and erasing their memories to build a neutral race devoid of character and emotion. Negotiations for a “hero car for ‘Lead Seeker’” started in early October 2011 and by the end of the month Lotus had agreed to provide a number of Evoras to the project directed by its screenwriter Andrew Niccol who was looking for an extraordinary car for the role. The Lotus Evora was chosen for its stunning and futuristic aesthetic, which when juxtaposed with contemporary locations, gives a truly alien element to the Sci-Fi movie. Lotus has a strong cinematic history; with appearances in two ‘Bond’ films – in ‘The Spy Who Loved Me’ out-racing a motorbike and helicopter before taking to the sea as the iconic submersible Esprit, and in a cool role in ‘For Your Eyes Only’; “cornering like its on rails” with Julia Roberts at the wheel in ‘Pretty Woman’; and taking part in an adrenaline fuelled chase sequence along the San Francisco coastline with Sharon Stone in ‘Basic Instinct’. No doubt the dynamic driving scenes featured in ‘The Host’ will take their place alongside these exciting movie moments as stand out performances for Lotus. Lotus fans around the world celebrated as Kimi Räikkönen takes the chequered flag, racing to victory during the first round of the FIA 2013 World Championship Formula One® race in Melbourne, Australia. 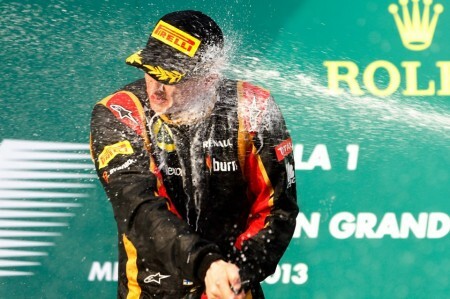 A force to be reckoned with, Kimi Räikkönen proved Lotus was the team to beat during a race marked by the threat of rain, and where tyre strategy was critical in the racing game plan. With the other front runners taking 3 pit stops, Kimi was able to preserve tyre condition, docking only twice over the 58 lap Albert Park course. From the off, the E21 showed its prowess, with a race pace that was nothing less than impressive, the fastest lap of the race 1:29.274. What marks the 20th win in his career, and the 81st for the Lotus name in F1® the former World Champion is now leading the 2013 F1® World Championship race. Team mate Romain Grosjean finished 10th, securing an important point for the team. All eyes are firmly on next weekends assault where the second round of the competition takes place at the Sepang circuit in Malaysia. Ladies and gentlemen, welcome to the 2013 Golden Gate Lotus Club autox season. The second event of the season is now open for registration for club members on MotorsportReg. Register early as a sell out is expected. For an added challenge we plan to run the course in the reverse direction in the afternoon! The price is the same as last year. First time autox’ers (first time at a GGLC event) are eligible for a discount, so invite your friends along too. Non-members will be able to register one week later. For Lotus Elise/Exige/Evora drivers, please use the classification tool to calculate your index points and choose your class. For non-Lotus cars, please use the appropriate SCCA class. Don’t hesitate to contact me if you have any questions about this year’s events or any other autox topic. Another great video by GGLC member Ben Beames. 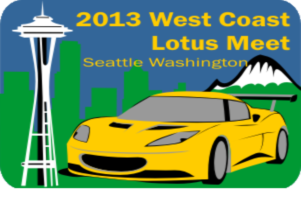 The West Coast Lotus Meet (WCLM) is heading to the Emerald City of Seattle, Washington in the summer of 2013! Members of the Evergreen Lotus Car Club (ELCC) are hosting the 2013 WCLM in conjunction with the Southern Nevada Lotus Club, Lotus Owners of Phoenix, Club Lotus Northwest, Lotus Car Club of British Columbia and the Golden Gate Lotus Club. With Mt Rainier, Puget Sound and the city of Seattle as backdrops, the 2013 WCLM will be four days of total Lotus celebration that will start with a bang on July 4th. What can you expect at the 2013 WCLM? The 2013 WCLM will be headquartered at the Red Lion Inn in Bellevue, Washington. Discounted rates have been negotiated for everyone attending the WCLM and there will be a special complimentary parking area to accommodate all of our cars, plus there will be car washing facilities available during the entire WCLM. Head over to the official West Coast Lotus Meet website for registration and more information about WCLM 2013. Early registration ends on March 18th!!! Registration is now open for the Golden Gate Lotus Club’s second track day of the year at Laguna Seca Raceway in Monterrey, California on Wednesday, April 3rd. We will be running (3) run groups with approximately 20 minute sessions each. Your options will be Advanced Group, Intermediate Not-So-Fast Group, and Intermediate Fast Group. There are a limited number of Beginner slots available and those entrants will run in the Not-So-Fast Intermediate group. Beginners will be required to have a coach assigned to them to ride in the passenger seat in order to enter the track. Price is $170 for members and $190 for non-members. This event will fill up fast so be sure to sign-up early to ensure you get a spot. 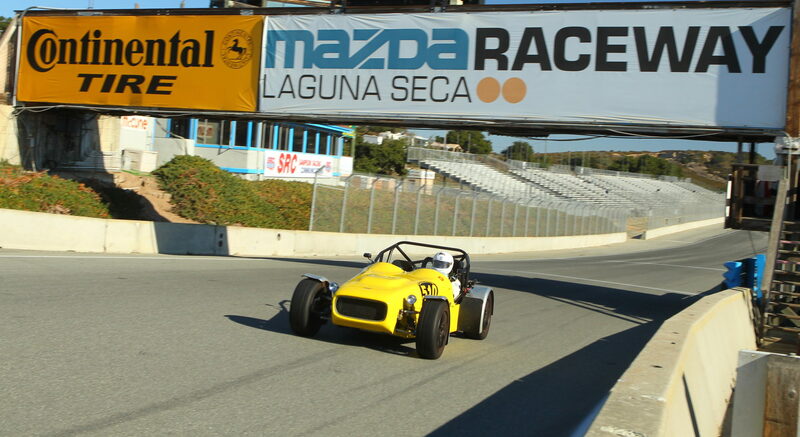 Due to the restrictions imposed by Laguna Seca on the number of cars allowed on the track at one time, there will be no bridging of run groups as we normally do at other venues. Also, be aware that there will be absolutely no refunds. If you cancel before March 15th and we can fill your spot, we will give you a rain check for a future event. Only sign up if you know you can attend. We will run this event rain or shine. Also, THIS WILL BE A 92dB EVENT! DO NOT BANK ON LIFTING AT THE SOUND CHECK – if your exhaust or intake is loud, please take measures to reduce your levels before the event. Please read your confirmation email as it has been expanded to include the general schedule.